POKETTO will be up in Bronx this Sunday. Bring your family including your little ones! - POKETTO will be participating Boogie on the Boulevard street event hosted by Bronx Museum of the Arts along with One Stop Family Pop Up! At Grand Concourse between 165th and 166th street, The Bronx. The center lanes of the Grand Concourse from 162nd St to 170th St will be closed to traffic and open to a world of fun with music, art+. “POKETTO” will be up On Montague st this Saturday. August 11th : 10-4pm. Participatory Public Installation, POKETTO, will be at Brooklyn Borough Hall Saturday Green Market as a part of “One Stop Family Pop Up”. Come to see me and donate your old clothes with pockets to add on the installation. “If you could find anything you wish in a pocket what would it be? Write it. Draw it. Leave It in a pocket. Read what others said.” It continues to grow with thousands of responses to a question. It originated in March 2011, right after the massive earth quake, tsunami and Fukushima nuclear plant incidents which have killed over 18,000 people in Japan, where I am originally from. “Sevol” at Lower East Side. Musashino Consortium 2018, Musabi Almni exhibit. - May 20th, reception May 9th, 6-8pm. Gallery OneTwenyEight 128 Rivington Street, New York, NY. 10002. W-Sat:1-6, Sun: 1-5pm. Come to see me and other 13 artists. Installing day with Rice Ball lunch brake. 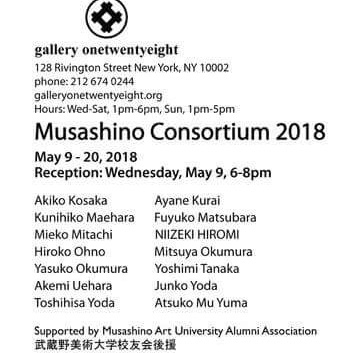 Come to see me and other Japanese Artists who’ve resided and worked in NY for decades. The reception is Wed, May 9th, 6-8pm, at OneTwentyNine Gallery, 129 Rivington Ave, New York, 10002. What Dwelling means to you? A space could be divided into this side and the other side by a piece of wall. What dose this side mean to you? What about the other side? When I still lived in my parents house that was a newly built large modern house in suburban Tokyo, I did not enjoy being there. It was such a great feeling to live in my own old small studio apartment with sharing vault toilet. You never know what makes someone happy. 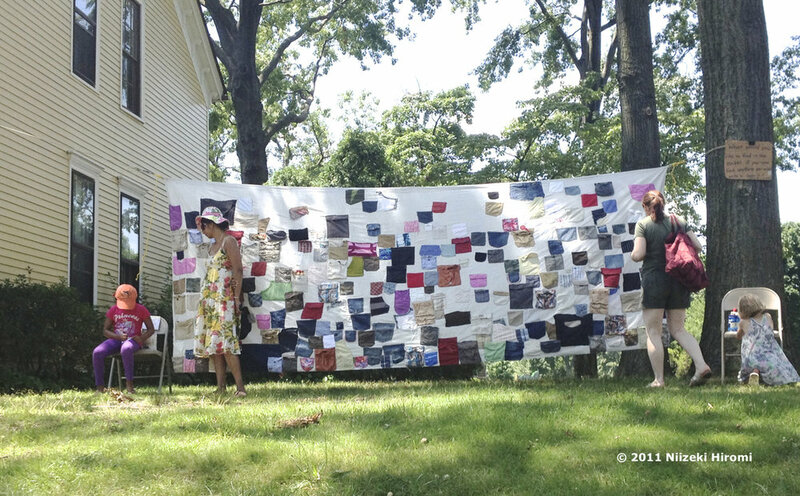 It is great to be able to participate QAI17, Queens wide Public Art Event as my 4th year. Thank you. Yvonne Shortt, for your great effort to make it happen again. MokoMoko Windows at ICFF until tomorrow. Installation MokoMoko Windows, a series of collage with MokoMoko shaped windows from window envelopes, 2003. Experience different colors, patterns of security camouflage print as if you are included in a envelope. ICFF Gallery, #2501, ICFF NYC 2017 at Javits Center closes, Tomorrow, 24th, 4pm. Contact me for admission pass. 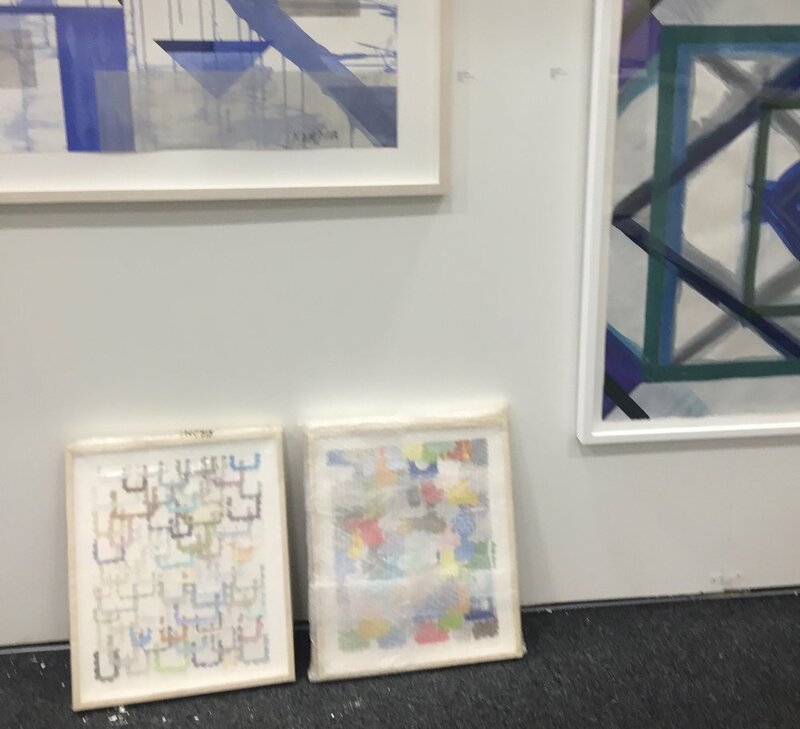 Last day, MokoMoko at Art on Paper, Pier 36, NYC. Today, till 6pm. Works before taking photos of discarded materials, MokoMoko Shaped windows from used window envelopes. MokoMoko means cutie chubby in Japanese. I wanted to give unpractical sense on this mas produced product after their duty. I cut them with scissors one by one with my hand. MokoMoko camouflage with windows, ready to go. 2003. Open Today! GumHearts Tattoo Parlor Project in SoHo.